It was a hot and steamy summer in Bethany Beach Delaware in 1961, when the Fasnacht family vacationed in this rustic and charming destination just off the coast of the Atlantic Ocean. Located The about twenty miles north of Ocean City, Maryland, Bethany Beach was a vacation hotspot for the those who lived in the north, and for the Fascnacht family it was a much needed break that summer from the family business called Willow Mill Park, a small picnic park in which they owned and operated in Harrisburg, Pennsylvania. Little did they know at the time during this family vacation, that a huge and unexpected business opportunity would present itself. While in Bethany Beach that summer, they visited the park called the ‘Sport Center’ and met the owner Mr. Dentino, in which the Fasnacht family struck up a conversation with about the business with the conversation then taking quite a twist from the ins-and-outs of owning the Sports Park to ‘do you want to buy the business’. Surprised by the possibility and challenges of accepting this new venture, the Fasnacht’s returned home, discussed accepting this offer and shortly thereafter contacted Mr. Dentino and accepted his offer to purchase the park. The closing date was set for March 15th, 1962 and as the closing date of the purchase was approaching, so was the immense and devastating Great Atlantic Storm of March 6th, 1962. After the storm came to pass, both the Fasnacht and Dentino families met at the site, assessed the damages, and an agreement came to pass to work out an allowance for the destruction in which the storm had caused. From that point on the park ‘Funland on the Boardwalk at Rehoboth Beach’ came to pass, and began baby steps in its expansion by adding additional attractions and even purchased along the way additional properties that were closest to the park for their growing family. Today, Funland on the Boardwalk at Rehoboth Beach has something for the entire family, and is a plethora of fantastic amusement rides framed with spectacularly colored lights, echoing sounds of electric music, awesome games, and the sinister haunted house, ‘The Haunted Mansion’. Rides and games are on a pay-as-you-go basis and include eighteen thrilling rides, thirteen midway games, an electronic shooting gallery, redemption center, arcade with various video games and pinball machines. The Haunted Mansion was added in 1970, and is a terrifically terrifying ride through a maze of horror with ghastly ghouls around each corner, lifeless legs dangling above, a secret passageway, a spooky graveyard with a swarm of giant rabid bats that lunge at every guest with only death on their minds, a three-dimensional head spinning in a box in another room, and more grisly and wickedness that awaits on this ride of terror. This is just a small example of the gloriously frightening moments to experience at ‘The Haunted Mansion’. In addition to the wondrous amenities and incredible excitement that Funland on the Boardwalk at Rehoboth Beach has to offer, it has been home to the Annual Sandcastle Contest for over thirty-years. August 6th 2011 marks the thirty-forth Annual Sandcastle Contest that will be held at Fisherman’s Beach at the north end of the Rehoboth Beach Boardwalk. Participants work in teams, for a total of one-hundred teams and include incredibly gifted sand-sculpting artisans who work tirelessly in creating sculptures with themes from sea life to swamp animals. There is no time better than now than to visit Funland Park on the Boardwalk at Rehoboth Beach as this year it is celebrating its fiftieth-year anniversary. Festivities begin May 14th 2011 for the event and all amusement rides will be free of charge with guaranteed fun for the entire family. For its many years in existence, Funland Park on the Boardwalk at Rehoboth Beach has been committed to continue its tradition of old-fashioned carnival ambiance, and is devoted to preserving it as such. 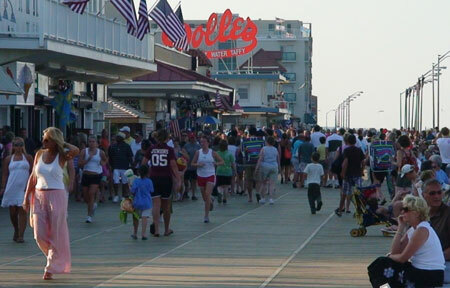 Easily accessible by car, Rehoboth Beach is a popular mid-Atlantic coast resort and is in close proximity to New York, New Jersey, Pennsylvania, Maryland, and the D.C. area. About the Author: Tim Ryan is a blogger keeping readers updated on the Naples Real Estate . Tim specializes in helping buyers and sellers in the neighborhoods of Naples Park. To learn more about Naples Park Florida visit Tim’s website.